Education has been a major area of focus and a poll plank for Aam Aadmi Party (AAP), which came into existence in November 2012 in the backdrop of anticorruption movement of Anna Hazare with the promise of doing a different brand of politics principally to take forward the agenda of ‘unheard and unseen’ common man. At the same time, during the last four years in office, systemic education reforms intended by it have not made much headway because of its turf war with ‘an indifferent’ central government, which through lieutenant governor has the last word in governance structure of Delhi. There is a lot of buzz around your government’s fixation of school system in Delhi. Some people say much of this is hype and your party’s politicization of education? It is our dream that education should be part of politics and why not? Policies are required for education not some cow or religious issues and let me tell that a society which doesn’t make education part of politics or thinks it is wrong, that society cannot progress. Policies are needed for education and not for cow or religious issue. The countries that have made it that way have progressed and the world is following and copying them. Parents are receiving publicity blitz (letters) from SMCs? Is that fair? Letters to parents, why shouldn’t I talk to parents, they have a stake and right to know. For me education is my ‘mann ki baat’ and the medium available to me is letter instead of radio for those whose talk is about polarizing issues. Your government’s uneasiness and at being logger heads with the central government is now a full four-year journey in itself? Modi government has been anti education and enemy of children of Delhi. We amended Delhi School Act for bringing in transparency, accountability and reform in private schools, central government stalled that. We made a policy for budget schools and submitted it, again, nothing happened. It didn’t recruit teachers and so on. One of your election manifesto promise was to bring in transparency in admission process in private schools especially for the nursery class. While you may done so in part, private schools lobbies are acrimonious of what they call government breathing down their necks all the time. Citing disallowance of fee hikes, they allege private school autonomy is at assault under AAP government? Let me make it clear private schools are not outside the purview of law and government policies. There are some good private schools that follow law but there are schools that think otherwise as if these were shops. Till law in this country says education is a charitable activity and doesn’t allow profiteering and commercialization, we will continue to enforce it. Education is not a saleable product. We will not allow loot of parents in the name of fee hike simply because some school wants to buy a Mercedes car for its director or money to open school chain. I am not doing it on my own but there are rules that everybody needs to follow. Those who feel they are not making money should shut down and go to those counties where it is allowed. On the question of autonomy, we are not interfering. Autonomy is about learning/teaching and there we haven’t. But when it comes to lack of transparency and noncompliance to rules, I’ll interfere. At the same time, your party’s promised cleaning act of the private school system from alleged malpractices especially capitation fee and lack of transparency didn’t go very far? There are instances where people tell me that a nursery seat is sold at as high as Rs 15 lakh and there is no lower limit. At the moment under the rules we can deregister a school but that creates own problems like making teachers unemployed and bringing students on road. So, we had taken legislative route and brought a few amendments to Delhi Education Act in 2015 for bringing in transparency in admission process and other enabling issues but then it was stalled by the union government. On the other hand, private school lobbies are using courts for similar objectives. There is no going back and we have already made EWS admission process simple and online. Private schools say, why doesn’t government start nursery classes in government schools? As I said already, all schools are part of the integrated system and first of all that has to be understood. It is not ours and yours. There are allegations that your model is quasi-privatization done at the behest of some big international NGOs as you have signed MoUs with some of these? These are baseless and by those people who have a set mind about education as an administrative work. They have clerical mindset and want that a clerk should dictate/ interact to a teacher or principal because there is no trust in teachers. We have brought in experts in the setting and this has broadened the horizons for teachers and principals. They now interact and discuss things that are relevant to them. Because of this, teachers have started looking beyond the mundane, write papers, get Fulbright scholarships, go to conferences, meet independent experts and innovate. They are experiencing growth and are happy. Talking about teachers, don’t you think having 33% teacher vacancies and making up these with guest teachers is an under achievement? Yes I agree, it is a failure. But people should know who is at fault. Modi government says, teacher recruitment is its domain. Fine, provide us the teachers. In a way this central government has been an enemy of children of Delhi. One more issue related to teachers in government schools is their surveillance as is being told? CCTV cameras, GPS fitted tablets etc. hurt teacher trust. I again say these things are said by people who don’t have understanding of school and classroom environment. First of all, we think today’s teacher of 21st century should be well-versant with devices and technologies as they have to teach a generation of digital natives. So, we have provided tablets to teachers. CCTV or classroom monitoring is not a big brother keeping an eye but an administrative model. Parent wanting to know if his child is in school, student knows he is being watched for any bad behavior. Till four years back, everybody accepted that government schools are a failed system. Our aim is to decentralize and foster a culture of transparency. Segregation of students in middle classes and also secondary classes has also raised eyebrows and experts feel this is against child rights and learning process? I would say most people in this country don’t have understanding of education though they may have some knowhow of schooling or romanticism about certain theoretical concepts about it. Let me stand in a classroom for a couple of hours and see the practicality of interventions. When we started our intervention, 76% were not able to read their text books. When a student did understand P, how would he learn Pythagoras theorem. Thanks to the work we done in classrooms, this trend is now reversing. But then you are also accused of adding to drop outs as the students who fail twice in 10th are not allowed in the school? A student who is aged more than the average age of the class and that too, who is not academically interested, creates problem for other students in the class. So, we encourage these students to appear through open schooling. This also means the supply quality of students from municipal schools is at the root of this problem. Why don’t you start from class 1 in own your schools or takeover municipal schools? We have told them that we are ready to take over but again these bodies are controlled by party that is inherently against education as they fear that if people get education, there won’t be people to buy their brand of politics. 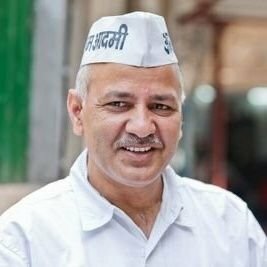 Full statehood of Delhi is also necessary because unless DDA comes under state, the land issue remains a biggest stumbling block. The government schools combine today cater to about 25 lakh children in Delhi and another 12-15 lakh are in private, budget and other schools. So, to make school provision for every child is distant dream as of now. But our efforts are on. Your high budget provision (25%) for education has come for a lot of praise and rightly so as it has vastly improved the infrastructure of schools. How much are we done? We started with 54 schools and thereafter it is an ongoing process, we have added 21 new school buildings with modern facilities and constructed 8000 equivalent classrooms. As we can’t vacate schools, this activity is going side by side. You have been saying that real development is good education and not flyovers or roads necessarily. Now after 4 years in office, do you feel you have delivered on it? And your Delhi success is a model for the country and by that yardstick a poll plank for your party? A lot of work is left. We were stopped from doing things we wanted. My house was raided by CBI. Despite all odds, we have shown that the government schools can be potentially fixed. My take is first we have to make these schools work for those students who are there and in doing that we will set the narrative under which 98% of schools in developed counties are public schools and a choice of people. Education is a political issue, you like it or not. We will make it a big issue and a poll plank, no doubt about that.